CORRUPT Benoît Battistelli has a lifelong obsession with bodyguards; it didn’t start at the EPO but at INPI apparently. INPI wants more people inside the EPO and “revolving doors” is what Benjamin Henrion called it. “INPI has been corrupting the process during the swpat [software patents] debate, as any other NPO in other countries,” Henrion added. There are clinical words that describe Battistelli’s chronic paranoia, which has created a deeply toxic atmosphere at the Office and has cost it over a million euros just in ‘bodyguard bills’ (not that these French firms/bodyguards would mind the unchecked money flow). 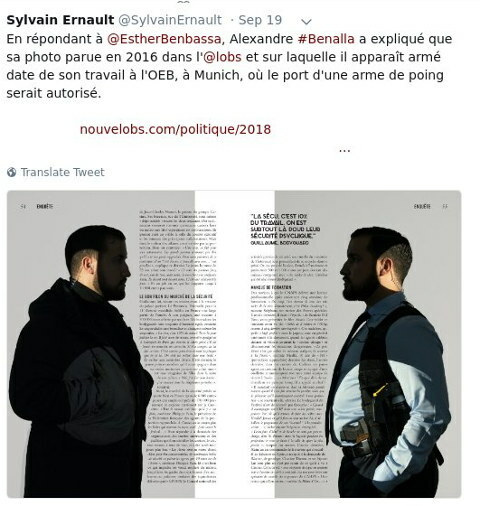 “Some mainstream French media approached us for further pointers and has apparently asked the Liar in Chief for a comment.”A few days ago we wrote about the firearms aspect (see article/image above), confirmed in light of the Alexandre Benalla scandal. Some mainstream French media approached us for further pointers and has apparently asked the Liar in Chief for a comment. We can’t really read French (not properly), so we rely on occasional translations. Maybe SUEPO will produce and publish some soon.